Local voluntary group, the Friends of the River Crane Environment (FORCE – or Citizen Crane) keep an eye on the river Crane, which flows past Heathrow. They monitor the water quality, oxygen levels and invertebrate numbers. It appears there is a current problem with blooms of pale grey brown sewage fungus on the river bed found immediately downstream of the Heathrow outfall. In the past there have been numerous incidents of water pollution caused by the use of glycol to de-ice planes. This then gets in to water balancing reservoir, and hence into the River Crane. Algal blooms are formed, due to the pollution, reducing the water’s oxygen and thus harming, or killing, creatures in the river. Heathrow is thought to have recently installed a £17 million water treatment system, and it had been hoped this would end the pollution incidents caused by glycol. However, it does not yet appear to be working as expected. FORCE will continue to monitor the situation closely and will also request a statement from Heathrow. Reports from our Citizen Crane teams and the general public indicate that the fungal blooms we saw in the river over the last two winters have re-appeared during the last few days. These are manifesting as blooms of pale grey brown sewage fungus on the river bed (see close up photo from Donkey Wood from last Saturday) found immediately downstream of the Heathrow outfall and evolving to a darker brown silt cover to the river bed in Crane Park further downstream. The water colour is reported as being a distinctive grey-green colour throughout much of the river to the Thames at Isleworth and a foam is developing downstream of higher energy sections. Our volunteers also report reduced invertebrate numbers and diversity from their weekend kick sampling surveys. Following a number of severe fungal blooms in previous years Heathrow Airport has recently invested heavily in a new treatment system to deal with the glycol it uses to de-ice the aircraft and runways. These recent observations suggest the system is not yet working as expected. We shall continue to monitor the situation closely and will also request a statement from Heathrow. Citizen Crane volunteers at the three downstream sites in the river (Donkey Wood, Crane Park Island and Mill Road) have reported a pollution event – with low numbers of invertebrates in both January and February alongside extensive fungal blooms. The problem is particularly severe at Donkey Wood (see photo of the bloom from 5th March 2018) and appears to be linked to the outfall from Heathrow’s Eastern Balancing Reservoir. The findings are being investigated by the Environment Agency as well as Heathrow. Historically, periods of cold weather have been followed by fungal blooms and linked to the use of glycol as a de-icer at the airport. Given the Citizen Crane data precede the recent severe cold weather last week then this problem may well intensify in the coming days and weeks. Our next survey will be on the weekend of 17th March. FORCE understand the growth causes harm to invertebrates by smothering the river gravels and depriving them of oxygen. It should not be a risk to human health – although of course anyone going into the river should always carefully wash their hands before eating or drinking. FORCE are in regular contact with Heathrow and the EA and will report any further information we receive. It is suggested that anyone with dogs looks at the water first and keep them out if there is a lot of fungus. The amount will vary with time and location but could be present anywhere downstream of Donkey Wood to the Thames. It should not harm the dog but could be a major job to clean out of their fur. Judging from the experience of previous years the fungal growths will slowly dissipate over the next few months – and the river would benefit from heavy rainfall and high flushing flows. Heathrow has responded to this long standing problem with interim improvements to the handling system at the Eastern Balancing Reservoir from this year and a new £17m treatment system is planned to be open by next winter. Hopefully this will be the last winter with glycol related pollution at this scale. Posted: Tuesday, February 19th, 2019. Filed in Air Quality, General News, News about Airports, Recent News. Aircraft Engine Standard: “A new stringency level that would limit the emissions of non-volatile Particulate Matter (nvPM) from aircraft engines was agreed. The ICAO standard is expected to drive technologies to address non-volatile particulate matter, which in the long run will minimise their potential environmental and health impacts.” ie. for planes yet to be built, with any impacts decades ahead. At least admitting the problem of PM particles produced by planes. On noise ICAO said: “The meeting also delivered …improvements of aircraft noise up to 15.5 dB below Chapter 14 limits for single-aisle aircraft by 2027, NOx emission by 54 per cent relative to the latest ICAO NOx SARPs and fuel efficiency up to 1.3% per annum can be expected for the new aircraft entering into production.” Again, for new planes, with no real impact for decades. On CORSIA they said CAEP had agreement (not spelled out) on how to assess life-cycle CO2 emissions reductions for biofuels or other lower carbon fuels. ie. not a lot. ​Global measures to address aviation’s environmental impact were agreed at a meeting of the two hundred and fifty experts of ICAO’s Committee on Aviation Environmental Protection (CAEP), which concluded today ICAO’s Montréal headquarters today. Global measures to address aviation’s environmental impact were agreed at a meeting of the two hundred and fifty experts of ICAO’s Committee on Aviation Environmental Protection (CAEP), which concluded today. CAEP is a technical body of the ICAO Council, and all the technical recommendations agreed by CAEP above will be considered by the Council for final approval. A UN ICAO committee, Committee on Aviation and Environmental Protection (CAEP), with the job of cutting global aircraft carbon emissions (an issue of global concern) is meeting secretly, for discussions dominated by airline industry observers. The committee always meets behind closed doors; the press and other observers are not allowed in (unlike other UN committees). The committee’s agenda and discussion documents are not released to the public or the international press. Anyone who leaks documents being discussed faces “unlimited liability for confidentiality breaches”, according to ICAO rules. The only non-governmental body not linked to the airline industry allowed into the meeting is the International Coalition for Sustainable Aviation (ICSA), made up of a small group of international environmental NGOs. Transparency International says “Agencies which set common global standards for large, international industries have to be transparent in order to prevent capture by corporate interests … ” A key concern is that the committee wants to certify biofuels, that are definitely NOT environmentally sustainable, as low carbon. And also fossil oil, produced using solar energy – also NOT a low carbon fuel. The committee needs to be open to public scrutiny. The UN’s ICAO is a secretive organisation, that has been woefully ineffective in limiting the CO2 emissions of global aviation. There are considerable concerns that it will try to get bad biofuels certified as low carbon, in order to whitewash the sector’s emissions in future. The global deal, CORSIA, making the first tentative steps towards restricting aviation CO2 at all is just starting. There is, elsewhere, growing understanding that biofuels are generally not the way forward, and their real lifecycle carbon emissions are far higher than their proponents make out. ICAO has now agree 2 criteria (out of 12 possible) for aviation biofuels. These are that there should have been no deforestation after 2009; and there should be at least a saving of 10% of green house gas emissions, (including emissions from indirect land-use change or ILUC) compared to fossil jet kerosene. ICAO’s environment committee will develop rules for what biofuels can be credited – ie. how much of an emissions reduction each biofuel delivers. The effect can only be accurately accounted for using models. There is a serious danger they will try and include palm oil. And countries like Saudi Arabia are trying to get “lower carbon” fossil fuels included, if their production can be 10% more carbon efficient. So aviation will continue to emit vast amounts of carbon for decades…. EU countries can end the decades-long exemption on taxing aviation fuel. Legal experts say it is possible to tax kerosene on flights between EU countries. This could either be done at EU level through a series of bilateral agreements or by agreement between individual countries. Transport & Environment (T&E) has found that the old argument that foreign carriers’ operating within the EU – de facto a small number of flights – can’t be taxed can be overcome by introducing a de minimis threshold below which fuel burn would not be taxed. At present (and for decades past) airlines, unlike almost all other forms of transport, pay no fuel tax on flights within or from the EU – even though aviation causes 5% of global warming. They also pay no VAT. Despite the aviation industry’s attempts to hide behind the 1944 Chicago Convention, when the agreement was made on not taxing aviation fuel, that is not what is preventing fuel taxation. In fact it is old bilateral ‘air service agreements’ that European governments signed up to years ago that include mutual fuel tax exemptions for non-EU airlines. It remains too hard to tax fuel for international, non-EU, flights. Posted: Saturday, February 16th, 2019. Filed in Air Quality, Biofuels News, Climate Change News, General News, Noise News, Recent News. Noise will be an absolute key area of the flight path consultation and our responses. However, what about air quality and emissions? Will an extra 25,000 flights with the existing two runways bring about any deterioration in air quality? NO2 (Nitrogen dioxide) is harmful to humans. According to a UK Government study in 2015 “Studies of long-term exposure to NO2 report associations with all-cause, respiratory and cardiovascular mortality, children’s respiratory symptoms and lung function”. NOx is a generic term for NO and NO2. NO is relatively unstable and will convert to NO2 if exposed to oxygen. Ultra-Fine Particles (UFP) do not have a specific legal definition, but scientists consider these to have a diameter of up to 0.1 micrometres or 100 nanometres. They do however come within the legal definition of PM2.5s since they will pass through a PM2.5 inlet or filter. Ultra-Fine Particles are particularly harmful as when emitted there are so many of them and they have a large total area. They are known to get into the blood stream and in recent research by Queen Mary’s University Hospital have been found in the placentas of pregnant women. According to the Kings College air quality group LondonAir, the PM concentrations in all London Boroughs in 2016 failed to meet the reduction requirements. The projection is that the boroughs of Richmond, Wandsworth, Hounslow and Hillingdon will improve but all be above 13 micrograms per cubic metre of PM2.5s in 2020 rather than the target of 8.5 micrograms. NO2 is no better. In 2013, updated in 2016, Hillingdon had substantial breaches. By 2020 Heathrow and its surrounding areas are still forecast to breach. Heathrow itself is forecast to still be in breach of the NO2 limit in 2030 – and that is with 2 runways. 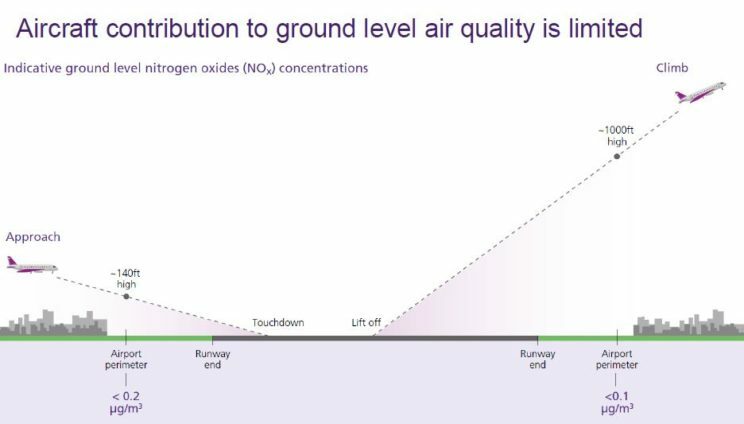 Heathrow has stated in the past that it does not consider that it is bound by the air quality targets within the airport boundary as it is private land. So; will a third runway detract from the steady improvement in air quality? The view of Heathrow is supported by the Government. Sir Howard Davies and the Airports Commission’s advisors, Jacobs, set a study area of just 2 kilometres from the expanded airport boundary. The Government Appraisal of Sustainability carried out by WSP of Exeter expressly followed the study area of Jacobs keeping it to 2 kilometres from the boundary. Empirical evidence would suggest that it is not right and that planes emit significant amounts of NO2 and particulates, which find their way down to the ground (and by definition into humans and living creatures as well as vegetation). The DfT deny this but the empirical evidence does not support the DfT. Studies between 2014 and 2016 at Los Angeles, Atlanta and Schiphol, Amsterdam, strongly suggest otherwise. Mobile monitors set up under the inward flight paths show that particulates and NO2 are transmitted by the wind up to some 20 kilometres down wind. We know from the recent news the terrible impact of poor air quality upon vulnerable people like asthma suffers. Should we have increases in pollution from planes – not to mention the land vehicles that will be going to and from an expanded airport? “More recently, Riley et al. 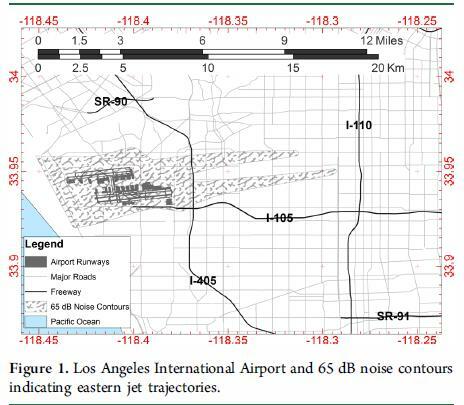 (2016) measured downwind of two large airports in the USA: LAX and Hartsfield-Jackson International Airport (ATL – Atlanta, GA), using a mobile monitoring platform. Riley et al. (2016) found a 3–5-fold increase in UFP concentrations in transects under the landing approach path to both airports, relative to surrounding urban areas with similar ground traffic characteristics. The measurements therefore suggest that aircraft plumes mix downwards to a sufficient extent to be detected at ground-level at concentrations similar in magnitude to road vehicle sources. The implications of this work are potentially important for exposure to UFP concentrations. For example, a location such as Heathrow Airport, where aircraft tend to approach the airport from the east (flying over the London conurbation), there is potential for considerable exposure to UFP from aircraft”. The short answer is that the Government do know of this research. Posted: Wednesday, January 30th, 2019. Filed in Air Quality, News about Airports, Recent News. No government minister ever got anywhere without being able to think two contradictory ideas at once. So why should Michael Gove be different? Bizarrely, the H-word doesn’t get a mention in Mr Gove’s 109-page document. But maybe he didn’t want to draw attention to one awkward fact: that air quality around the airport is already in breach of EU limits for nitrogen dioxide emissions. True, Heathrow’s not the main culprit: the key cause is the cars on the adjacent M4, M25 and A40. The airport reckons it directly contributes only 16 per cent of emissions at two key monitoring sites. Even so, the government is yet to spell out how things will be improved by adding 260,000 flights and 50 million passengers a year. So here’s the key quandary: how to convince a judge that an airport already in breach of legal air quality limits will be less in breach after a vast expansion project. True, post-Brexit (should that ever happen), the government could simply ignore the EU’s pesky limits. But that hardly squares with Mr Gove’s latest plan. So what are the other options? Well, Heathrow’s proposed low-emission zone within the perimeter fence will help, but the main problem is outside the fence. And even if you’re daft enough to believe its claims that it can handle an extra 50 million passengers without any rise in cars to and from the airport, what about the traffic going past? Airports create business, £61 billion of benefits from the third runway apparently, [in fact, when the costs are subtracted from possible benefits, the net figure is somewhere between +£3 billion and about – £1.5 billion – DfT’s own figures – AW comment] which in turn creates traffic. And even if passengers will have the option of the (delayed) Crossrail, what about the freight? Volumes are meant to be doubling. Is that also coming by public transport? As Mr Gove reiterated yesterday, the government’s big idea is to end the sale of new petrol and diesel cars and vans by 2040. But it’s years away: far too late for this year’s judicial review over a runway due to be in service by 2026. Will a judge really allow that to go ahead on a government promise that things may be better 14 years after it starts operations, not least a promise from this government? In fact, that’s the problem with Mr Gove’s latest effort: it’s mainly hot air. Not mentioning Heathrow tells you that. Posted: Wednesday, January 23rd, 2019. Filed in Air Quality, News about Airports, Recent News. A recent McGill study found unusually high concentrations of potentially harmful airborne nanoparticles around the airport. It is interesting to note that citizens on the streets ask for more studies on the subject. It is a matter of public health. 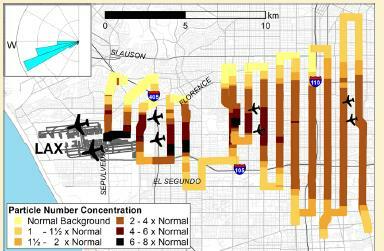 The new study found a high concentration of particles around the airport. Some contain heavy metals, like Chromium and Arsenic. The study published in December in the journal Environmental Pollution detected up to 2 million particles per cubic centimetre. This is more than the amount found so far in any measurement at any other airport. People near the airport report black spots on garden furniture, probably from the airport. It is better to get as many studies as possible on this, for health. Residents agree more studies should be done. Most of the airborne particles are considered benign, but some nanoparticles include heavy metals that could be hazardous to your health. Although Dr. Parisa Ariya, who conducted the study, said these particles won’t kill you, the fact that there is a high concentration of certain nanoparticles means that more research will need to be done. Since Dr. Ariya’s study was only a physical and chemical one, she said it will require public health research. “It definitely reccommends a concentrated, integrated study,” Ariya said. President of citizen’s group ‘Les Pollués de Montréal-Trudeau,’ Pierre Lachapelle said he agrees that more needs to be done in terms of public health. “Now I think it’s time to see what is the public health concern,” he said. Concerns have already been raised, as Lachapelle’s neighbors have dealth with airborne pollution from jets leaving the airport left on their laundry. “There are black spots on their laundry at the end of the day,” Lachapelle said. He said he’s unsure of what that is, and Ariya said there are still many ‘unknowns’ out there. But for Ariya, what is known for certain is that it has to be looked at a little closer before jumping to any conclusions. “We have to do the research studies, with the collaborator from health sciences as well, then we would be able to see if the concern is valid,” Ariya said. Airborne particles at the Montreal International Airport were studied systematically. Total number density of aerosols reached a maximum of 2 × 106 cm−3. 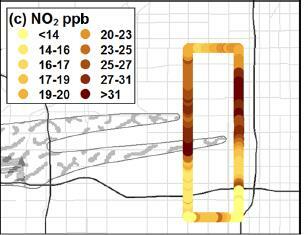 Correlations with pollutants (CO, NOx, and O3) confirm anthropogenic source of aerosols. Presence of metal/metal oxide emerging nanoparticles was detected. Airport pollutants can reach neighbouring populated areas, causing health concerns. Airborne particles, specifically nanoparticles, are identified health hazards and a key research domain in air pollution and climate change. 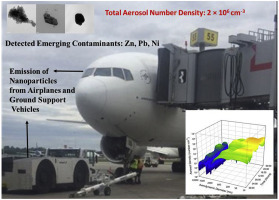 We performed a systematic airport study to characterize real-time size and number density distribution, chemical composition and morphology of the aerosols (∼10 nm–10 μm) using complementary cutting-edge and novel techniques, namely optical aerosol analyzers, triple quad ICP-MS/MS and high-resolution STEM imaging. The total number density of aerosols, predominantly composed of nanoparticles, reached a maximum of 2 × 106 cm−3 and is higher than reported values from any other international airport. We also provide evidence for a wide range of metal in aerosols, and emerging metals in nanoparticles (e.g., Zn and Ni). The geometric mean, median and 99th and 1st percentile values of observed nanoparticle number densities at the apron were 1.0 × 105, 9.0 × 104, 1.2 × 106 and 9.3 × 103 cm−3, respectively. These observations were statistically higher than corresponding measurements in downtown Montreal and at major highways during rush hour. This airport is thus a hotspot for nanoparticles containing emerging contaminants. The diurnal trends in concentrations exhibit peaks during flight and rush hours, showing correlations with pollutants such as CO. The HR-TEM-EDS provided evidence for nano-sized particles produced in combustion engines. Implications of our results for air pollution and health are discussed. This paper has been recommended for acceptance by Prof. Wen-Xiong Wang. Posted: Tuesday, January 15th, 2019. Filed in Air Quality, News about Airports, Recent News. Heathrow has a consultation, closing on 4th March, on its future airspace, both for the existing 2 runways and with a possible 3rd runway. Heathrow claim they will take the responses and view of residents etc into account. However, Cllr Gareth Roberts, Leader of Richmond Council, has condemned the latest consultation – claiming 25,000 extra flights would be disastrous for the borough. He, said: “We have always said that Heathrow needs to be better and not bigger. But clearly size is everything to the airport. Heathrow are proposing the biggest changes to its flight path since it opened. People living in Richmond and other areas of West London will find their respite from overhead noise cut under these proposals. Not to mention the additional 25,000 more flights a year – which will no doubt be crammed into the early morning schedules, delivering more misery for our residents. Let’s not forget, these extra flights will still require Planning consent.” He said it was a bad case of the government “putting the cart before the horse” in having got a parliamentary vote in favour of the runway (many votes by MPs who very little indeed about it) before details of flight paths and other impacts were known. The airport is asking for local communities to help shape the airport’s plans for its future airspace, both for the existing runways and as part of the proposed expansion. The consultation will run until March 4 and focus on three key areas: Airspace change for an expanded Heathrow, airspace change to make better use of the current runways and future operations for an expanded Heathrow. There will be over 30 consultation events across local boroughs throughout the consultation period, where members of the public will be able to ask questions and provide their feedback. A full list of dates, times and locations can be found at : http://afo.heathrowconsultation.com The nearest local event is in Twickenham on the 13 February 2019 from 2-8pm in York House. Emma Gilthorpe, Heathrow’s Executive Director for Expansion, invites local people to participate in the consultation, she said: “Expansion at Heathrow is a unique opportunity to build a long term, sustainable legacy for those closest to the airport as well as for Britain. “We want to work in partnership with our local communities to ensure we make the most of the opportunity that expansion brings, including the creation of thousands of new jobs and apprenticeships. However, Cllr Gareth Roberts, Leader of Richmond Council, has condemned the latest consultation – claiming 25,000 extra flights would be disastrous for the borough. Cllr Roberts, said: “We have always said that Heathrow needs to be better and not bigger. But clearly size is everything to the airport. “Heathrow are proposing the biggest changes to its flight path since it opened. People living in Richmond and other areas of West London will find their respite from overhead noise cut under these proposals. “Not to mention the additional 25,000 more flights a year – which will no doubt be crammed into the early morning schedules, delivering more misery for our residents. Let’s not forget, these extra flights will still require Planning consent. 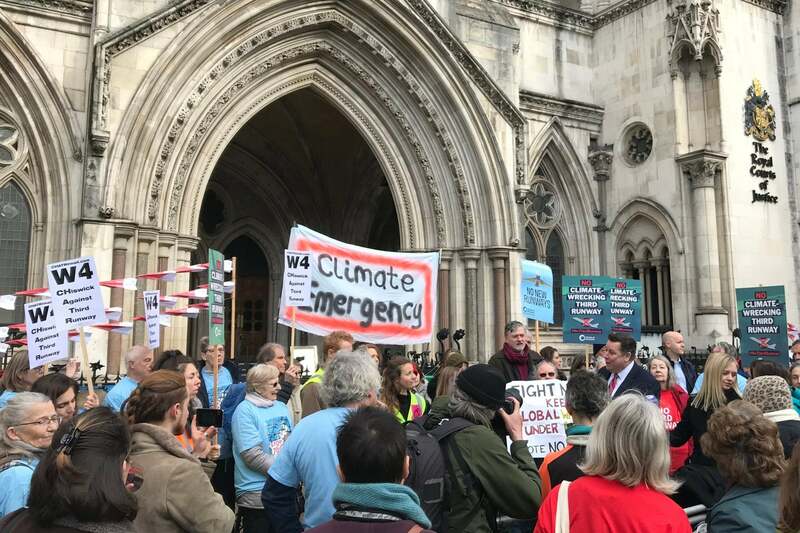 “This kind of expansion would see an unacceptable rise in noise and air pollution, damaging the environment and posing a risk to people’s health – and all at a potential cost to tax payers of billions of pounds. “It is extremely disappointing that only now we are seeing the proposed areas affected by additional planes, seven months after the Government made its decision to expand the airport. Richmond Council is part of a coalition of councils and others – including the London Boroughs of Hillingdon, Wandsworth, Windsor and Maidenhead, and Hammersmith and Fulham, as well as the Mayor of London and Greenpeace – that are seeking a judicial review of the Government’s decision to give policy support in the Airports National Policy Statement (“NPS”) for a third Heathrow runway. Posted: Thursday, January 10th, 2019. Filed in Air Quality, Blog, General News, News about Airports, Noise News, Recent News.